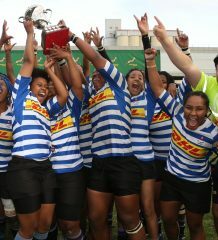 The Border women ensured that they remained on course to possibly host their sixth successive Women’s Interprovincial final as they defeated arch-rivals and defending champions, Western Province, in a table-topping clash in East London on Saturday. It was another action-packed round in the competition, with the A Section matches being closely fought, while big wins were the order of the day in the opening round of the B Section. In the table-topping tussle, Border built on a narrow 7-5 halftime lead against Western Province to earn a 19-10 victory in East London. The result ensured that they remained unbeaten after three rounds, while also allowing them to avenge their defeat against the Cape outfit in last year’s final. The Capetonians struck first in the 11th minute, but Border outscored them three tries to two in the end. The clash between KwaZulu-Natal and Eastern Province in Durban was tightly-fought as both teams tried hard to make their presence felt. Two first-half tries by the Eastern Cape side, however, pushed them 14-0 ahead at the break, but neither team was able to add to the score as the match progressed. The win for Eastern Province leaves them five points behind log-leaders, Border, and only one point behind WP with two pool rounds remaining. The Blue Bulls, meanwhile, were in fine form against Free State as they outscored the opposition seven tries to one, with Chantel Dikgale and Kemisetso Baloyi each scoring braces, for a convincing 39-5 victory. The win marked their first of the season. A dominant first-half showing allowed them to build up a 29-0 halftime lead, and despite the Free Stater’s best efforts to tighten up their defence in the second half, they conceded another two tries. In stark contrast to the A Section, the opening round of the B Section was dominated by big scores with five of the eight teams scoring over 30 points. Defending champions, SWD registered the biggest win as they overpowered the Griffons 35-0 in a one-sided encounter in George, while Golden Lions winger Piwokuhle Nyanda was in superb form for the 2017 finalists against the Leopards, scoring two of her team’s five tries and three conversions in their 31-14 victory. Boland also proved too strong for Griquas as they delivered a fine performance on attack and backed this up with a solid defensive effort for a 38-12 victory. The Limpopo Blue Bulls, meanwhile, edged the Pumas 38-36 in a hard-fought match in Polokwane as both teams gave everything on attack, but battled to contain the opposition on defence.